Nicknames "El Papi de Papis", "La Elegancia del 6X6"
La Máscara is a Mexican independent wrestler, previously a midcard tecnico in CMLL. From May 2005 to December 2006, he was Mexican National Welterweight Champion, with all of this defenses so far having come away from Mexico City. (He lost the belt to Sangre Azteca.) La Máscara is the son of Brazo de Oro, and the promotion acknowledges the relationship. 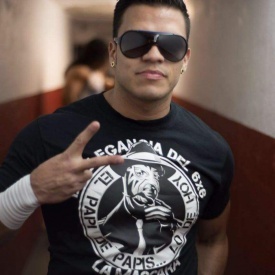 La Máscara has been pushed strongly since changing to that gimmick (from Brazo de Oro Jr.), with some thought that it might be due to his family connections. His work has appeared to catch up with his push this year, and he's a solid high flier. Became a member of Los Ingobernables. on left as Brazo De Oro Jr. This page was last edited on 3 February 2018, at 11:56.